In the middle of the Bering Straight, outside Nome, Alaska, is a storm-tossed little island called King Island. Today the island is abandoned, but 70 years ago a society of Inuits lived here, with their special brand of culture and a unique kayak. 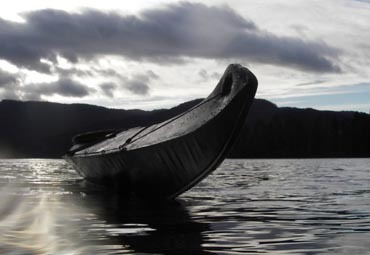 Their kayaks were primarily used for transport and walrus hunting in some of the worst weather in the world. The kayaks are short to ensure maneuverability in bad weather or breakers, but still have a good cruising speed, and good acceleration. This is a good kayak for paddling in storms or for surfing. It also has a large luggage capacity, which makes this type of kayak well suited for paddling trips provided you deprioritize high top speeds. Hi Anders! I'd like to return next summer to build another kayak, being at your place and building is the best part of the summer! The kayak is very seaworthy. I've been out 2 days in ROUGH seas: waves 2-4m high (and more!) I felt very comfortable in this boat, in situations I've never dared to seek out before. 3 paddling companions became quite speechless. I feel some slack sitting in the kayak, I'm going to fix that. I'll add 2 knee supports. A slogan for the King Island kayak should perhaps be: "Are you tired of waiting for your buddy? 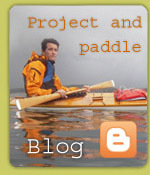 Build a King Island kayak." It's not as fast as the average kayak but there's not much missing. To keep pace with the others, I get more practice than my companions! It's fast when I'm paddling away in some waves. The kayak has such beautiful lines that it should be viewed from the outside. But to sit in the cockpit and see the pleasant bell shape of the front deck is what I like the most. The kayak has such beautiful lines that I look forward to showing it to you.